New Orleans is a city that loves its single artists. While there were many groups around in the 50s, they never achieved the status of the soloists. Of all the New Orleans groups, the Spiders were probably the most successful. Their first record was a double-sided hit and made Billboard's Top Ten for 1954. The Spiders started as a gospel group, the Zion City Harmonizers. By the time brothers Chuck and Leonard Carbo joined around 1950, the group had been together for many years. The members at the time were: Hayward "Chuck" Carbo (second tenor and lead), Joe Maxon (first tenor), Matthew "Mac" West (baritone), Oliver Howard (bass), and Leonard "Chick" Carbo (bass and alternate lead). Their pianist was Henry Wicks, who occasionally sang. Since they were all in their early 20s and had day jobs, they did a lot of rehearsing, but only sang at area churches on weekends. By 1951, the Zion City Harmonizers had renamed themselves the "Delta Southernaires." We were under the impression that we'd go down and make an audition for gospel songs. But when we got down there Cosimo wanted to hear the group to find out what kind of talent we had, because in those days vocal groups were the thing. Well, after we got there we tried the gospel songs, but they weren't looking for that, they wanted what they called Rhythm and Blues. So we tried out and I knew that we weren't going to make it from the expression on Cosimo's face. Then he asked us if we knew any Rhythm and Blues songs. So I started singing one of Buddy Johnson's old numbers and he didn't like that either. So I asked him if he'd mind if we rehearsed there a little while and he said OK. So we started singin' an old spiritual number, "Bye And Bye." Well he was listening in the control room and when it was over he said 'You guys got a good group.' But what he really wanted to do was take the spiritual and turn it into a Rhythm and Blues number. So he told us to go home and write some Rhythm and Blues songs and we came back with "You're The One" and "I Didn't Want To Do It." This was what Cosimo wanted. Then he said 'You guys come back here ready for rehearsal.' Then he called in Dave Bartholomew, Lee Allen, Earl Palmer and some other musicians and we did the session. Through Cosimo's contacts, (primarily Dave Bartholomew) the group ended up with a contract on Lew Chudd's Imperial label. At this time, the Delta Southernaires lost pianist Henry Wicks, who only wanted to be involved with gospel music. Their first session was held in the J&M studio on December 11, 1953. In spite of Matassa wanting them to be a pure R&B group, two of the four songs they recorded that day were spirituals (they may have been released in 1963, as Imperial 5995, under the Delta Southernaires name; that's what the Imperial catalog says, but no one has ever seen the record). The titles were: "I Didn't Want To Do It," "You're The One," "John The Revelator," and "Bye And Bye." Chuck Carbo led the two secular songs. We all put names in a hat and I had one of my kids pull them out. But no matter what name came out, someone would say 'Oh, that doesn't sound right' because he wanted his name chosen. Well we went through the thing two or three times and we couldn't come up with a name. My wife happened to be in the room and she spotted one of those big old wood spiders on the garage wall and she said we should stop arguing - there was a name for us. Well, we all agreed. If it had been a flea on the wall, we probably would've been called the Fleas. "I Didn't Want To Do It"/"You're The One" were released at the beginning of January 1954 and reviewed (both sides "good") on January 16. Other reviews that week were for the Orioles' "There's No One But You," Gladys "Glad Rags" Patrick's "Somebody's Lyin'," and Smiley Lewis' "Blue Monday." By February 20, "You're The One" was a Tip in New Orleans. As usual, a record company waited until at least one session had taken place (and, in this case, a record had been released) to announce the signing of an act. Lew Chudd proudly trumpeted the pacting of the Spiders in mid-January, after "I Didn't Want To Do It" had already been issued. By this time, Cosimo Matassa and Phyllis Boone were managing them; their sessions were produced by Imperial's New Orleans A&R man, Dave Bartholomew. Both sides of the record were hits: "I Didn't Want To Do It" remained on the R&B charts for 17 weeks, reaching the #3 position. "You're The One" didn't do as well, only staying on the charts for 3 weeks, but cresting at #5. This was a great first outing. However, the Spiders had a little secret: they were still the Delta Southernaires and still performing gospel music every chance they got. Their alter egos had to remain separate, because they knew they'd be ostracized from the church if they were caught singing Rhythm and Blues. Sure enough, WWEZ DJ "Jack The Cat" (Ken Elliott) let it slip that the groups were one and the same, and that's exactly what happened. Said Chuck: "We used to belong to the Historic Second Baptist Church and when they found out we really recorded that record, they barred us from singing in their church. Well after that there was nothin' we could do but just go out and make the bread, you dig?" In the early days of the Spiders, most of their material was written by tenor and guitarist Adolph Smith (a member of the Monitors), including "I Didn't Want To Do It," "You're The One," "Walking Around In Circles" and "I'll Stop Crying." Smith would also rehearse the group, but he wasn't a member of the Spiders and didn't appear with them. Their next session took place on January 19, 1954. The four songs they recorded that day were: "For A Thrill," "Mellow Mama," "Lost And Bewildered," and "Tears Began To Flow" (whose first stanza was "borrowed" from 1940's "Low Down Gal Blues" by the Lewis Bronzeville Five). They were all led by Chuck, except for "Mellow Mama," which was fronted by Leonard Carbo. On March 11, 1954, the Spiders went back into the studio to record "Why Do I Love You," "Love's All I'm Puttin' Down," "I'll Stop Crying," and the first version of "Mmm Mmm Baby." Once again, they were all led by Chuck Carbo. Also in March, they signed with the Shaw Artists Corporation as their booking agent. 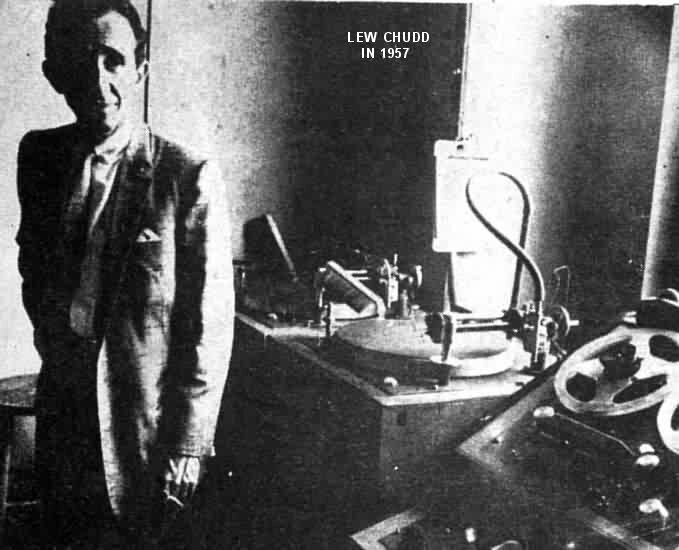 After hearing all these masters (and with "I Didn't Want To Do It" riding high), Lew Chudd, head of Imperial records, took a personal interest in Chuck and asked Dave Bartholomew to bring him to Hollywood. This was to have disastrous consequences. In 1954 [probably in late March] Dave Bartholomew had to go up to Hollywood for his regular report, 'cause he was the A&R man in Imperial's New Orleans office. So Lew Chudd told him 'When you come, bring Chuck with you, I'd like to meet him.' After the others heard that, there was a lot of grumbling because he didn't send for all of us. Well, what was I gonna do, sit home and grumble with them? I'm a dump truck driver and that man gave me more bread then I've had in my whole life. When I left Hollywood, The Man put a big check in my pocket, you dig? I came back home and nobody wanted to talk to me. So from then on it built up more and more. Then Lew Chudd came on about me going on my own. You know, I'll tell you about Lew Chudd, he was the best record company owner I've ever known in my life. If I needed bread I could get on the telephone and call him and he'd send it. I'm always grateful to Imperial Records; that's the best label I've ever been on. While Chuck was in Hollywood, Chudd tried to talk him into going out as a soloist. Chuck refused, since he'd spent so much time with the group, both in their gospel and secular incarnations. However, he did consent to lay down additional new lead vocal tracks for "For A Thrill," "Tears Began To Flow," and "I'll Stop Crying," which is why they have a dual lead/echo quality on them. When he got back to New Orleans and explained the situation, the others were still pretty mad with him anyway, simply because he'd gone without them. The Spiders' next session was held on April 15. The four tunes they recorded, all led by Chuck, were: "I'm Slippin' In," "Mmm Mmm Baby" (second version; this one made it to their Imperial LP), "Walking Around In Circles" (a reworking of "I'll Stop Crying"), and "I'm Searchin'." 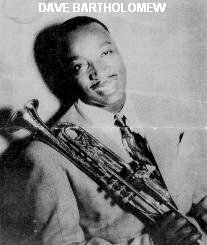 Starting with this session, most of the group's songs would be written by Dave Bartholomew, rather than by Adolph Smith. "I'll Stop Crying"/"Tears Began To Flow" were released in April 1954. Both received an "excellent" rating on April 24, along with the Charms' "Quiet Please," Big Maybelle's "I've Got A Feeling," the Diablos' "Adios My Desert Love," the Chords' "Cross Over The Bridge," and Lorraine Ellis & the Crows' "Perfidia." On May 15, "I'll Stop Crying" was rated a Pick Of The Week. 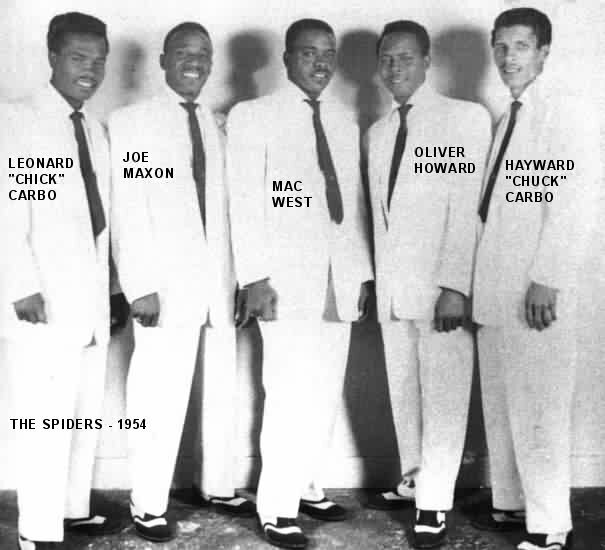 On May 14, 1954, the Spiders appeared at the Apollo Theater along with Charlie Barnett, Guitar Slim, Bunny Briggs, Phyllis Branch, and Pigmeat Markham. "I'm Slippin' In"/"I'm Searchin'" were released in June 1954. "I'm Slippin' In" was rated "excellent" on July 3, along with the Hawks' "It Ain't That Way," Johnny Otis' "Mambo Boogie," and the Thrillers' "'Lizabeth." "I'm Slippin In" would reach #6 on the R&B charts. The Spiders were scheduled to appear at the Savoy Ballroom in Los Angeles from July 9 -11, along with Jake Porter and his band (Porter was the owner of Combo records). However, the illness of Chuck's young son (from which he subsequently died) forced a cancellation, and they were replaced by the Hollywood Flames. Around this time, Joe Maxon decided to leave the group, weary of all the traveling the group was doing. 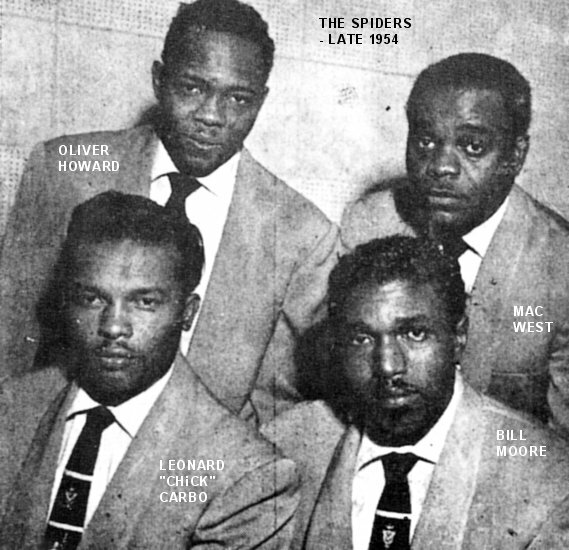 The Spiders got tenor Bill Moore and they continued on as a quartet (Leonard "Chick" Carbo, Oliver Howard, Mac West, and Bill Moore). This meant they had to both rehearse a new member and re-work their harmonies in time to record more tunes for Imperial. On August 3, 1954, the Spiders had their next session. All four tunes recorded that day were led by Chick Carbo: "The Real Thing," "She Keeps Me Wondering," "21," and "That's Enough." Four days later, their June release, "I'm Slippin' In," was considered a Tip in Nashville. "The Real Thing"/"Mmm Mmm Baby" were released later in August. Both were rated "excellent" on September 18, along with the Chords' "Zippity Zum," the Hawks' "Give It Up," Richard Berry & the Dreamers' "At Last," the Heralds' "Eternal Love," the Diablos' "The Wind," the Romeos' "Love Me," the Du Droppers' "Boot 'Em Up," and the Native Boys' "Native Girl." Imperial released "She Keeps Me Wondering"/"21" in October 1954. "21" (a reworking of Jewel King's 1950 smash "3x7=21") got an "excellent" rating on November 27, along with Dinah Washington's "Teach Me Tonight," the Wrens' "Beggin' For Love," the Cookies' "All Night Mambo," the 5 Willows' "Look Me In The Eyes," the Peacheroos' "Be Bop Baby," the Love Notes' "Since I Fell For You," the Solitaires' "Chances I've Taken," and Arthur Gunter's "Baby Let's Play House." "21" would be their fourth R&B chart hit, peaking at #9. On November 12, the Spiders were part of Cecil Bowen's "Hall Of Fame" tour. It kicked off in Kansas City, Missouri and wound through the Midwest. The Spiders shared the bill with Faye Adams, Amos Milburn, the Orioles, Al Savage, Billy Clark, Ursula Reed, and the Joe Morris Orchestra. The November 20 edition of the show was held at the Madison Rink in Chicago, hosted by WGES DJ Sam "Jam With Sam" Evans. It cost the 4000 fans who attended $1.75 in advance; $2.00 at the door. "That's Enough"/"Lost And Bewildered" were issued in January 1955, but don't seem to have been sent out for review. They should have appeared in the February 12 list of reviews, as did the Hawks' "It's Too Late Now," just one release number away from "Lost And Bewildered." On February 4-6, the Spiders finally made it to the Savoy Ballroom in Los Angeles, where they appeared with Chuck Willis. However, soon after they returned, baritone Mac West quit, not being happy that Chuck had never rejoined the group. He was replaced by Issacher "Izzycoo" Gordon (also known as "Junior"). "Sukey, Sukey, Sukey"/"Am I The One" came out in March 1955. "Am I The One" was rated "good" on April 16. Other reviews that week were for Lavern Baker's "Bop-Ting-A-Ling," Christine Kittrell's "Call His Name" (with Little Richard in the background), Bobby Mitchell & Toppers' "I'm In Love," the Concords' "Candlelight," and the 5 Echoes' "I Really Do." "Bells In My Heart"/"For A Thrill" were released in May 1955. They both got "good" reviews on June 11, along with Ray Charles' "This Little Girl Of Mine," Bo Diddley's "Diddley Daddy," the Voices' "Two Things I Love," the Hearts' "Talk About Him Girlie," the Robins' "I Must Be Dreamin'," Otis Williams' "Gum Drop," the Miller Sisters' "Hippity Ha," the Medallions' "Edna," and the Casanovas' "Hush-A-Meca." "Bells In My Heart" was a Tip in New Orleans on July 23, but never charted nationally. The Spiders had been hitless for three records in a row, causing Lew Chudd to step in and get Chuck Carbo to return for their next session. On August 27, 1955, Chuck and Chick laid down four tracks, all led by Chuck: "(True) You Don't Love Me," "Witchcraft," "You Played The Part," and "Is It True." But who were the others on the session? Chuck has said it was the original five, including Joe Maxon, Mac West, and Oliver Howard. More probably, it was Chick's group (Oliver Howard, Bill Moore, and Issacher Gordon). "Witchcraft"/"Is It True" was their September 1955 pairing. They both received a "good" rating on October 8, along with Clyde McPhatter & Ruth Brown's "Love Has Joined Us Together," the Cues' "Burn That Candle," the Midnighters' "Don't Change Your Pretty Ways," the 4 Fellows' "Angels Say," the Cats' "I Don't Care No More," the Sycamores' "I'll Be Waiting," Rosalle & Donnelle's "Beginning Of Our Love," and the Scarlets' "Kiss Me." "Witchcraft" was a Tip in Los Angeles on November 12 and reached #5 on the R&B charts during its 11-week national run. The Spiders made appearances all over the United States - from the Apollo to Los Angeles. Strangely, the one place where they didn't play all that much was New Orleans (at least not many of its bigger venues). While all of their appearances featured R&B material, they never stopped practicing gospel. At a show in Evansville, Indiana they met Ray Charles. Discovering that that Ray liked spirituals too, they sang far into the night with Ray doing both lead and harmony. "Don't Pity Me"/"How I Feel" were released in February 1956 (as "Chuck Carbo & the Spiders"). 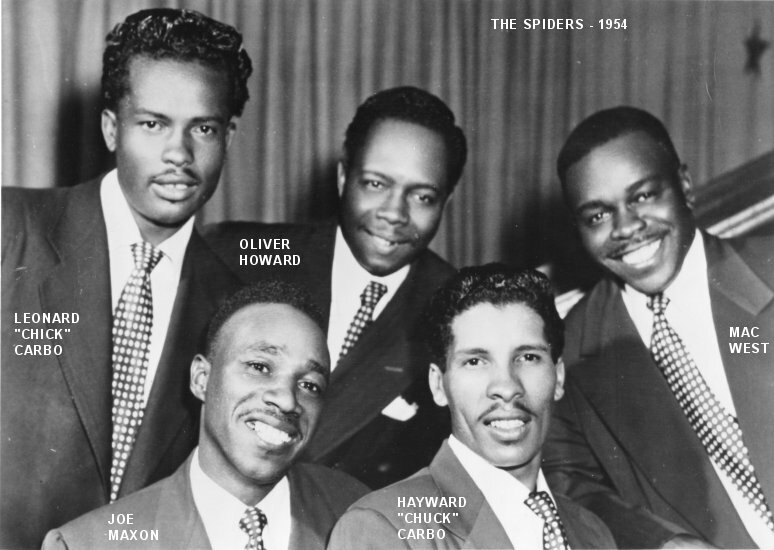 On February 10, the Spiders (Chick and the group) were back at the Apollo Theater, this time with Lloyd Price, the Drifters, Bubber Johnson, Mickey & Sylvia, and Bunny Briggs. (Confused yet?) Then, the Spiders were off on a 90-day tour as part of a package which included Ruth Brown, Chubby Newsome, and Screamin' Jay Hawkins. "Don't Pity Me"/"How I Feel" were reviewed on March 24 along with the Robins' "Cherry Lips," the Sheppards' "Mozelle," the El Capris' "Oh But She Did," the 5 Swans' "Lil' Tipa-Tina," and Nappy Brown's "Open Up That Door." 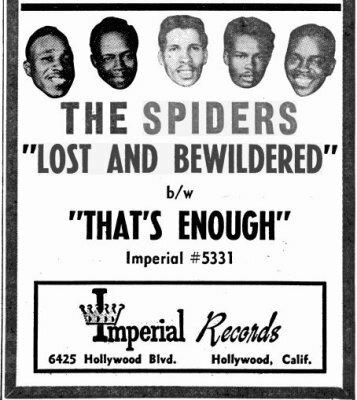 The May 5, 1956 session saw Chuck back with the Spiders again. Not only the Spiders, but the original Spiders (Chuck, Leonard, Joe, Mac, and Oliver reunited one last time). They recorded "Dear Mary," "A-1 In My Heart," "Without Love," and "Someday Bye And Bye." The first three were led by Chuck; the fourth by Chick. 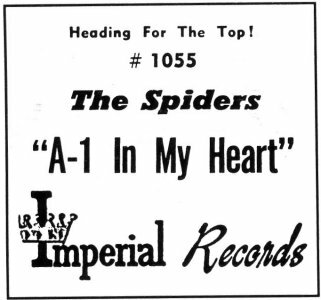 "A-1 In My Heart" and "Dear Mary" were issued in early June (as "The Spiders, with Chuck Carbo") and given "excellent" reviews on June 16. 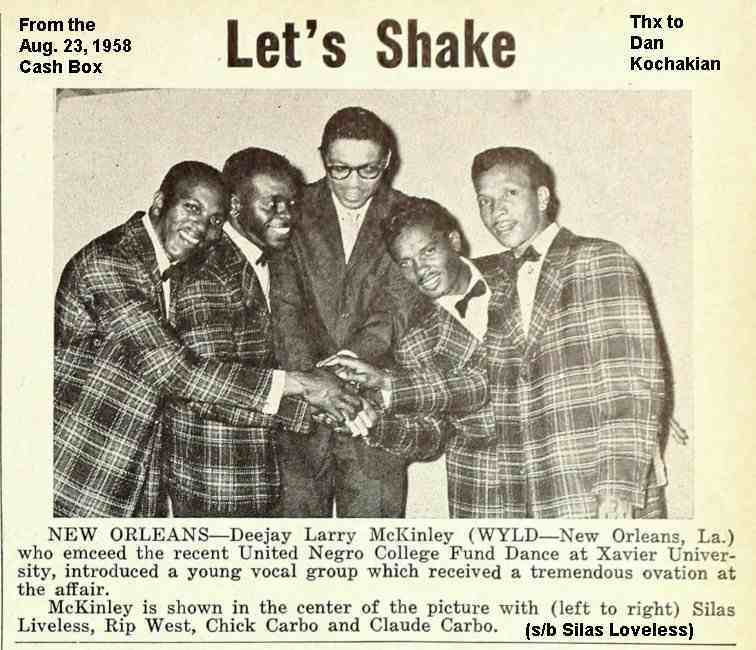 Other reviews that week were for the Platters' "My Prayer," the Dominoes' "St. Therese Of The Roses," Little Richard's "Rip It Up," the Suburbans' "I Remember," the Castelles' "Happy And Gay," the Rockets' "Be Lovey Dovey," the Nutmegs' "Key To The Kingdom," and the Champions' "The Same Old Story." Soon after this, the group pretty much split up. Leonard "Chick" Carbo wandered off to record for Atlantic (his signing was announced on August 26, 1956 and "Sentimental Journey Blues"/"My Love, Your Love" would be released in November). He'd go on to record for Vee-Jay, Instant, International City, and Revue (see discography). In spite of his solo activities, he kept the Spiders together for occasional appearances. "Goodbye"/"That's The Way To Win My Heart" came out in September 1956 (as "The Spiders, with Chuck Carbo") and were reviewed (both "good") on September 22. Other reviews that week included Fats Domino's "Blueberry Hill," the Teenagers' "ABC's Of Love," the Clovers' "From The Bottom Of My Heart," Shirley Gunter's "I Just Got Rid Of A Heartache," the Jayhawks' "Don't Mind Dyin'," Young Jessie's "Hit, Git & Split," the Vibraharps' "Cozy With Rosy," the Palms' "Darling Patricia," the Jewels' "She's A Flirt," the Flairs' "Aladdin's Lamp," and Marvin & Johnny's "Hey Chicken." On November 29, 1956, Chuck Carbo and Joe Gaines recorded another four tracks: "That's My Desire," "Better Be On My Way," "Honey Bee," and "I'm Glad For Your Sake." Once again, Chuck did most of the background harmony parts himself. 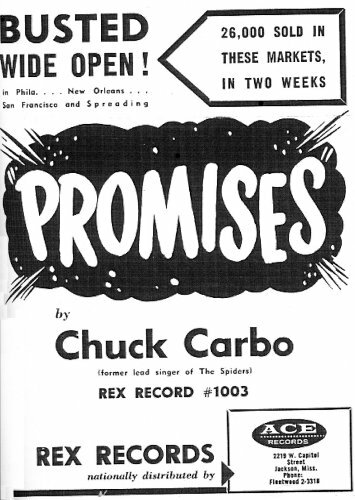 "That's My Desire"/"Honey Bee" were the December 1956 release (one last time as "The Spiders, with Chuck Carbo"). They were finally reviewed on February 9, with "That's My Desire" ranked "excellent." That week's reviews also included Shirley & Lee's "That's What I Wanna Do," the Del-Vikings' "Come Go With Me," the Scooters' "Someday We'll Meet Again," the Monitors' "Our School Days," the Starlarks' "Fountain Of Love," the Titans' "So Hard To Laugh, So Easy To Cry," and Big Daddy and His Boys' "Bad Boy." Finally, Lew Chudd decided it was time for Chuck to start his solo career. On April 22, 1957, he recorded "Poor Boy"/"The Bells Are Ringing"; these were released in June. Originally recorded as solos, the Anita Kerr Singers were overdubbed later on. His other Imperial session was held on September 1, at which time he recorded "I Miss You" and "Times," which were released in December. 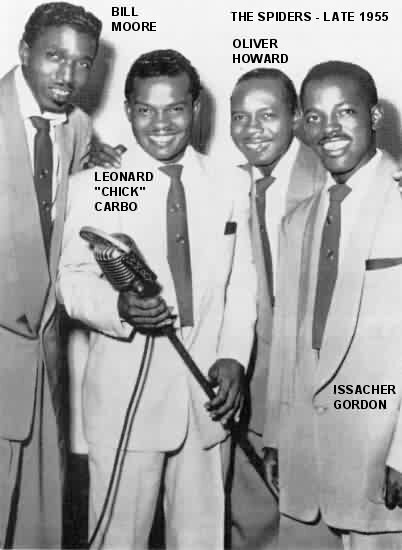 This time, Chuck was backed by Edgar "Big Boy" Myles (who had been with the Sha-Weez; he duets with Chuck on "I Miss You") and Issacher Gordon. When neither of these releases had any success, Chuck's contract with Imperial wasn't renewed. That's really amazing. Considering all the time and effort that Lew Chudd put into Chuck's career, it took no time at all to drop him when Ricky Nelson and Fats Domino had Imperial raking in money. Chuck subsequently recorded for Cosimo Matassa's Rex label, Ace (which had distributed Rex), Teem (a subsidiary of Ace), Etah ("hate" spelled backwards, if you find that significant), Canyon, Fireball, Superdome, and 504 (see discography). There were also a couple of albums on Rounder in the 90s. 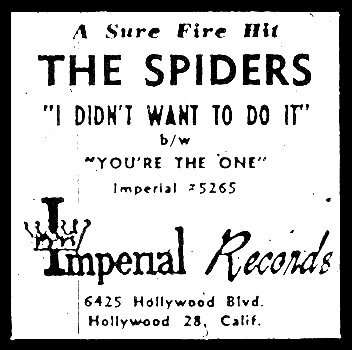 For some reason, Imperial re-released "I Didn't Want To Do It," backed with "You're The One" in August 1959. This probably coincided with Imperial's release of an LP called Hitsville U.S.A., which contained eleven songs by six artists (the Spiders, the Bees, Wee Willie Wayne, the Jewels, Smiley Lewis, and Bobby Mitchell). While most of them had only one song, the Spiders were represented with five: "I Didn't Want To Do It," "I'm Slippin' In," "Witchcraft," "The Real Thing," and "Bells In My Heart." 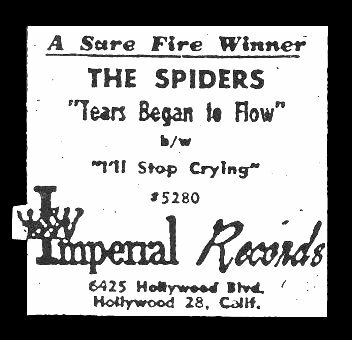 Then, on October 27, 1960 Leonard Carbo and the Spiders returned to Imperial to re-record "You're The One," along with "Tennessee Slim." The Spiders were still together, although not appearing all that much: Bill Moore, Oliver Howard, and Issacher Gordon. Leonard sounds great on "You're The One," which is, however, over-violined in the spirit of the times (and I can't hear a single Spider anywhere). 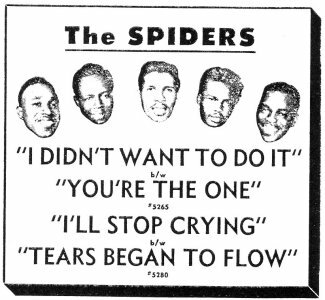 "Tennessee Slim" is, in my opinion, one of the worst things the Spiders ever recorded (the guys are mostly singing in unison, with a nod to Willie Mabon's "I Don't Know" thrown in). The sides were released in November. 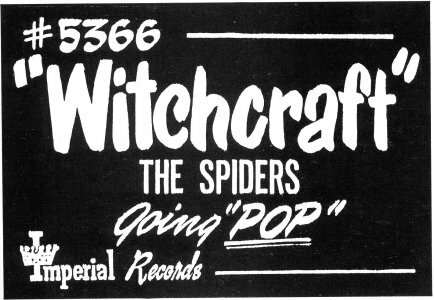 The last gasp of the Spiders was in 1961, when Imperial reissued "Witchcraft" in April. It's flip was "(True) You Don't Love Me," a master from their August 1955 session. This was probably released around the same time as I Didn't Wanna Do It, an LP featuring a dozen songs, including some hits, some misses, and even a few unreleased gems: "I Didn't Want To Do It," "You're The One," "I'm Slippin' In," "Mmm Mmm Baby," "Walking Around In Circles," "I'm Searching," "That's Enough," "Sukey, Sukey, Sukey," "Am I The One," "Don't Knock," "(True) You Don't Love Me," and "Witchcraft." Although the Spiders had more problems than most groups, they still managed to represent the finest group sound New Orleans had to offer. Hayward "Chuck" Carbo passed away on July 11, 2008. Leonard "Chick" Carbo, Bill Moore, Mac West, and Oliver Howard are also deceased. In mid-2007, Mac West, Adolph Smith, Issacher Gordon, and Dave Bartholomew were still alive, as was Cosimo Matassa (now involved with Matassa's Market [the family business], he was possibly the most important contributor to New Orleans R&B). In June 2010, Joe Maxon is the only member still alive. Special thanks to Victor Pearlin Ads are from various editions of Galen Gart's First Pressings series. Discography courtesy of Ferdie Gonzalez. Other sources I used were: Rick Coleman's 1982 "Chuck Carbo and the Spiders" article in Wavelength and his 1992 liner notes to the Bear Family's The Spiders: The Imperial Sessions; and the Spiders section of Todd Baptista's Group Harmony: Echoes Of The Rhythm And Blues Era. Note that "Can I Be Your Squeeze" was written by Eddie Bo and published by Wally Roker, former bass of the Heartbeats, who had gone into production. Canyon was a Hollywood label.